“Manam, Naman… I am yet I am not. I am so lost in your love, I am in this world and I am not…” Thus read the Farsi poem behind one composition by the Indian musician Sonam Kalra and her Sufi Gospel Project, to which the Egyptian audience had the privilege of listening during the seventh International Samaa Festival for Spiritual Music and Chanting (20-27 September). The festival filled a number of Cairo theatres with Egyptian and international troupes that mix music with spirituality. 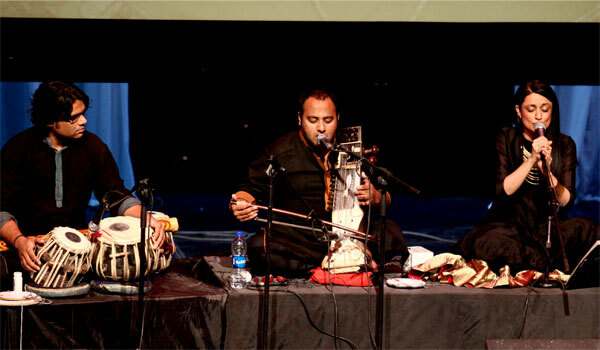 Sonam Kalra and the Sufi Gospel Project performed for the festival’s opening and closing nights, and gave a special concert at the Opera on Wednesday 24 September. With her versatile experience and captivating voice, Kalra travels along the numerous paths of faith, picking up a creative blend of mundane and otherworldly material to deliver her message. At times reaching out to poetry in her music, at other times singing well-known Western songs arranged by Kalra, the group brings about a sense of interfaith harmony. As she explained during the opera evening, Sonam Kalra, the Sufi Gospel Project represents different voices of faith, religion and language welded by the musicians into a single voice, “the inner voice of God” as she puts it. Kalra represents the Sikh religion, yet throughout her artistic development she has sung Christian gospel songs. She believes that “since God has many religions,” she “should be allowed to call out to Him in any way, any language, any manner that seems right.” As such Kalra touches on much musical material, from the gospels and jazz to bhakti devotion music and Sufi rituals. Kalra’s velvet voice, almost angelic in its texture, is strong and pure. Her peaceful on-stage disposition is reinforced by the equally inspiring musicians seated on either side of her. Ahsan Ali, a remarkably talented performer, plays the sarangi (a bowed, short-necked string instrument known to Hindustani classical music); at times he also sings, a second voice that generates wonderful harmony with Kalra, enriched by the occasional third voice of Rajesh Prasanna, who mainly plays traditional Indian bamboo flutes. 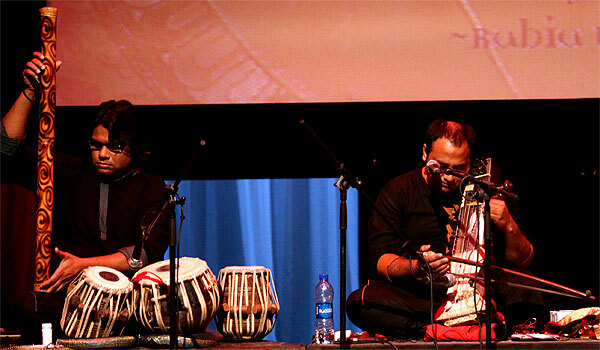 Amaan Ali Khan plays tabla, Tarit Pal percussion and Anil Chawla keyboard and piano. Most of the musicians in the project come from gharana families that maintain musician lineages. At the same time, they are a melting pot of faiths, Christian, Muslim and Hindu as well as Sikh. Though the musicians have performed together for only three years, there is an uncanny understanding between them, as if they grew up in the same household and shared the same life experiences. The music they create together has about it a captivating sense of unity that affects them, it seems, as much as the audience. At times they move between rhythmic frames, while at other times they go beyond them altogether, wandering the terrain of improvisations in which they move as one unanimous entity. What joins them together is art they create, straight out of their souls, convincing the audience with their musical capabilities, intuition and intellect emerging from the many arrangements, original compositions and improvisations, as well as the sheer honesty of their artistic expression. “The music is not here because of us, but rather we are here because of music. I always underline the fact that we have to cherish and respect it, we have to remember that it’s a gift from God,” Kalra says, explaining her sense of family within the group. The Cairo evening included songs to Farsi and Panjabi Sufi poetry, along with the well-known Christian hymns Abide with Me, Cohen’s Hallelujah, Ray Charles’ Hallelujah I Love Her So, John Lennon’s Imagine and a rendition of an Irish traditional tune. In the hands of Kalra, even such well-known compositions take on new meaning. Kalra takes her time telling each story; her songs are lengthy, with each turning into a memorable journey through music and lyrics. Yet Kalra’s project is not intended to touch the soul of religious listeners only; it does not recognise borders, be they religious, spiritual or intellectual. It is the creative rendition of the group’s spiritual and artistic sense of identity, which carries them above any one specific religion and past any musical genre. Kalra’s music speaks to everybody, and everybody can enjoy its intensity. As much as the Sufi Gospel Project’s history reveals how natural and spontaneous the group’s formation was, disconnected from any one religion, it is the artistic and spiritual development of Kalra herself, a singer with her own musical philosophy, that gives the Sufi Gospel Project its central beat. Born in New Delhi to parents who valued art, music and literature, and filled the household with knowledge and liberal thinking, Kalra believes that both her mother and father were her greatest teachers. “My parents have had a great influence on me. People always ask me where and what I’ve been studying. And though I studied Indian classical as well as Western music and explored jazz and gospel, it is important to underline that it was my parents who launched my philosophy of life and beliefs,” she tells Ahram Online. Kalra recalls both of her parents with love and warmth. In fact, during the Opera performance she referenced her mother’s verses, which have inspired her to date. “My mother headed the Music Heritage Society, specialised in promoting Indian classical music. Music was present in our household all the time,” she clarifies. The society would gather in homes and hold small intimate concerts, to an audience of 50-60 people, during which they would cherish and share Indian classical music. It became a performance platform for Indian classical music performers, young and old, who otherwise did not receive sufficient attention. It also hosted several acclaimed names. Kalra reveals that many music teachers visited her home; music was part of her life, entering the artist’s soul. In fact Kalra’s mother saw in her daughter much more than just a child who liked to sing in a house soaked in culture. The wise woman knew that she had a girl whose voice could capture people’s hearts beyond gatherings of family and friends or small-scale public appearances. Indeed, as time revealed, Kalra’s voice was yet to speak to international audiences, touching them in a same way as it moved her mother. Her journey to Sufi Gospel Project is filled with love of music, of God and of her home. Kalra continued working on the songs and arrangements. In May that same year she performed in one of New Delhi’s celebrated arts venue, belonging to the India Habitat Centre. Karla was no stranger to the place as she had performed jazz in its small auditorium a few years before. This time however she was offered the big theatre. The concert proved a great success, with the audience rewarding Kalra and the Sufi Gospel Project with an incessant ovation. Indeed since then Sonam Kalra and the Sufi Gospel Project have taken audience around the world by the storm. They have performed on many stages across India and other Asian countries, making equally well-received appearances in the USA, London, and the Arab countries, often at festivals dedicated to Sufi and spiritual music. After Egypt, Sonam Kalra and the Sufi Gospel Project will perform in Tunisia and Lebanon, and later on in London and Singapore.